Laraine Day (nee Johnson) was an American actress and MGM contract star. She was an active member of The Church of Jesus Christ of Latter-day Saints. Day was born October 13, 1920, in Roosevelt, Utah, to a prominent Mormon family. The family moved to Southern California when Laraine was a teenager, and she became a member of the Long Beach Players. She obtained small roles in films in the late 1930's under several stage names. In 1939 she signed with MGM, going on to become popular and well-known as "Nurse Mary Lamont", the love-interest in a string of seven "Dr. Kildare" movies beginning with Calling Dr. Kildare (1939), with Lew Ayres in the title role. MGM never gave her the starring roles her talent warranted. Her best and most challenging roles came when she contracted with other studios. These roles included My Son, My Son! in 1940, the Alfred Hitchcock thriller Foreign Correspondent the same year, and The Locket in 1946. She played opposite major film stars, such as Robert Mitchum, Joel McCrea, Lana Turner, Cary Grant, and John Wayne. When television became a viable income source, Day found the small screen more inviting and less time-consuming than making movies, and she became primarily a TV actress. She hosted a TV show alternately called Daydreaming with Laraine or The Laraine Day Show (1951). 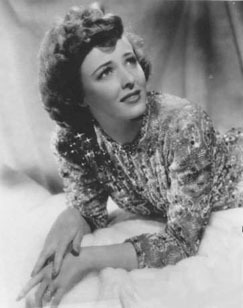 Laraine Day has a star on the Hollywood Walk of Fame at 6676 Hollywood Blvd., which she received in 1960. This page was last edited on 14 July 2016, at 21:39.